A backyard breeder and a kitten mill have many things in common. Responsible breeders strive to have none of those items present in their cats or cattery. A backyard breeder (Often referred to as BYB) is a term used to describe amateur animal breeders whose kittens are considered substandard, with little or misguided effort towards ethical, selective breeding. Kitten Mill (Sometimes called puppy mill even though kittens are bred) and large commercial operations breeding many, many cats, over and over with little regard to the health or welfare of the cats and kittens involved, are usually termed a mill, a kitten mill or a kitten farm. The reason for the existence of backyard breeders and kitten mills? Breeding just to sell and make money. Free enterprise is not necessarily a bad thing in the United States. 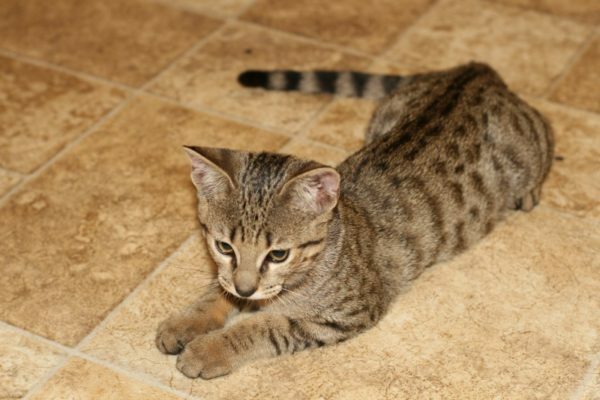 However, if it comes at the expense of the animals, it is a very bad thing and buying one of these kittens can lead to a big expense and headaches for those who simply wanted a cute lovable Savannah kitten. There are consequences for a backyard breeder and kitten mill that affect all breeders. No matter how ethical and caring the responsible breeder is, it hurts the entire breed. A kitten mill will knowingly breed cats with faults, others hear about faults and say the breed carries for that fault. In addition, if one person has a bad experience with a backyard breeder they will tell others and the ethical breeders suffer. Very good reasons to choose a responsible breeder from this site. Our breeders adhere to strict cleanliness and testing practices. Educate yourself and ask questions! Not all professing to be breeders who “care about the breed” really do care and some are fooling themselves. Some pet people care more than some breeders. Good breeders will question you about home, care, intentions etc. to be sure their cat is going to a great home. Ask about health and genetic tests. Health and immunizations are very important. What has the kitten been given, what does the breeder recommend or not recommend and why. Responsible breeders track this and make it available to their pet buyers to assure them of getting a sound kitten. It is very hard to tell about temperament and socialization over the internet. Perhaps ask your Savannah cat breeder for a video call over a smartphone or Skype would be wise. It will give you a chance to see the kitten and maybe even if the surrounding environment is a clean home or just a cage. Is your breeder pushy, trying to get you to buy now for a deep discount? Do they add a surcharge if you are paying with a credit card? Also be very aware of scams like Ashera Cats. Breeding program goals, talk about this because it will help you distinguish a backyard breeder or kitten mill from a responsible breeder. Responsible breeders have a breeding plan. A kitten mill or backyard breeder keep cats on the back porch or in the backyard in small cages. Often times not very clean or sanitary. How long has this breeder been doing this? Do they have references? What are the plans for the future of the breed? Check the contract. Does it have a spay/neuter agreement? Health guarantee? Never let a breeder make you show your cat. It costs you and it is their benefit. However, if you want to learn to show pick a breeder with experience and wins. Food is very important. Ask the breeder what food they feed and check to see if it is a premium food with no grains and GMO. Don’t let a breeder tell you all foods are basically the same and that they use a less expensive food for some odd reason. A responsible breeder should talk about this before you must ask about food, bedding, litter, special toys and basic daily care. Ask if the breeder is a member of TICA, ACFA or any other breed club with a code of ethics? Can the breeder show you their signed Code of Ethics from their Association? Does the pet kitten come with registration papers? Has the breeder taken the steps to register the litter yet? This may mean the difference between a breeder who will stall on sending papers and one who will never send. A breeder has no real way to prove that they can register cats or are an active member in TICA and that is where Savannah Cat Association comes in. Our members sign a member pledge, agree to arbitration and we actively check to see if they are current Savannah breed section members in TICA. Trust your feelings, if you’ve done your due diligence. Do not fall for a sob story or you will be the one sobbing.